Great for your dolls average 14" to 17"
Fits dolls 8" to 11"
24" by 27" Flat Fold. Free Set of Diaper Pins. One Newborn Size Diaper with Baby Mice Print. Great for your Baby Dolls 18" - 20" in size. One Newborn Size Diaper with Giraffe Print. 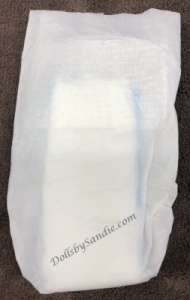 One Newborn Size Diaper with Hospital Baby Print. One Huggies Newborn Size Diaper. One Newborn Size Diaper with Kagaroo Picture. One Diaper - Luvs Newborn Size. Cute little purple monkey pictures on the front and back of this diaper. 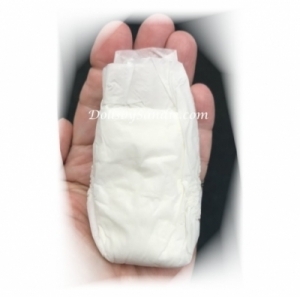 One Pampers Newborn Size Diaper. One Newborn Size Diaper with Surfboard Print. One Newborn Size Diaper with Tools Print. One Diaper - Size #1 with Cute Animal Print. One Diaper - Size #1 Animal Print Baby Diaper. Great for your Baby Dolls 20" - 22" in size. One Diaper - Size #1 Baby Diaper. One Diaper - Size #1 Cuddles Heart Print. Great for your Baby Dolls 20" - 22" size. One Diaper - Size #1 Hospital Diaper. One Diaper - Pampers Size #1. One Diaper - Size #1 Pooh Bear Print. Purple Monkey Print on both sides of diaper. Sweet Baby Animal Print on both sides of diaper. Great for your Baby Dolls 20" - 24" size.